﻿﻿After living in the Seattle area for over thirty years, and visiting Wright homes all over the country, it was time to visit the Griggs Residence right here in my own backyard. Over the years I had heard that the present owner preferred privacy. Wanting to respect that, I had always pushed it off. Armed with Storrer’s books and a letter requesting to photograph and tour the home, I was determined to find it, which turned out to be more difficult than I had anticipated. It is only a few miles off of I-5, but over the years, as lots were sold and streets developed, the address changed. I knew I was close. I questioned one neighbor who had lived in the area for 25 years, knew it was in the area, but didn’t have a clue. Others responded Wright who? After finally driving down every long driveway, Storrer’s description rang a bell. the company for six years and sold out in 1942 to their first employee. He then spent the bulk of his career as a lumber industry executive. Original drawing of the Griggs Residence. There are many classic Wright details, but it has a very unique feel. There is the hidden entrance. 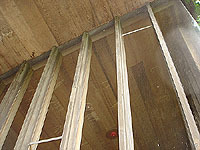 Exposed rough-cut cedar trusses, reminiscent of Taliesin’s Drafting Room. Mitered glass corners. Local cedar. Extensive floor to ceiling glass windows with multiple glass doors that open outward. It is built on a seven foot grid system rather than the standard four foot system. The stunning cantilevered roof over the Gallery Terrace extends fourteen feet past the floor to ceiling glass wall. There are double clerestory windows, the top row lightens the Gallery, the lower row lightens the Bedrooms. Three fireplaces, the one in the Lounge is large enough to stand in. Everything about this Usonian home is grand. 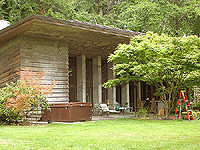 One unique feature about this home is the concrete block wall construction. 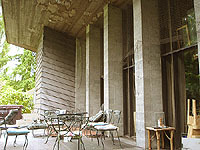 The standard concrete block home is constructed by staggering each row. These blocks are stacked directly on top of each other. 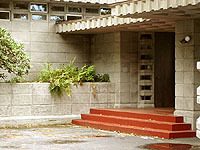 This is consistent with other block homes he designed, the earlier Textile Block homes, Florida Southern College and the later Usonian Automatic homes. ﻿Floor plan copyright 1993, “The Frank Lloyd Wright Companion” Storrer, William Allin, page 300. Edited and Photographed: Futagawa, Yukio, 1990, page 104-107. “The Frank Lloyd Wright Companion”, Storrer, William Allin, 1993, page 300. "Frank Lloyd Wright and the Meaning of Material" Patterson, 1994, page 29, 31. 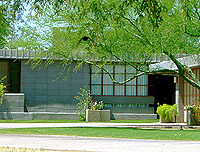 "Frank Lloyd Wright: The Western Work", Legler, Dixie, 1999, page 34-39. "The Vision of Frank Lloyd Wright" Heinz, 2000, page 210, 213. 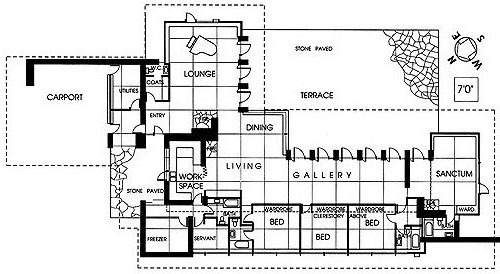 "Wright-Sized Houses", Maddex, Diane, 2003, pages 56-57. 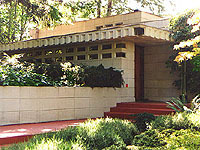 "Frank Lloyd Wright American Master", Weintraub; Smith, 2009, page 244. "Frank Lloyd Wright, Complete Works 1943-1959", Pfeiffer; Gossel, 2009, pages 94-95. A) “History of Tolland County, Connecticut”, by J. R. Cole, W. W. Preston & Co. New York 1888.
the Boot: The Story of the St. Paul & Tacoma Lumber Company” 1982.